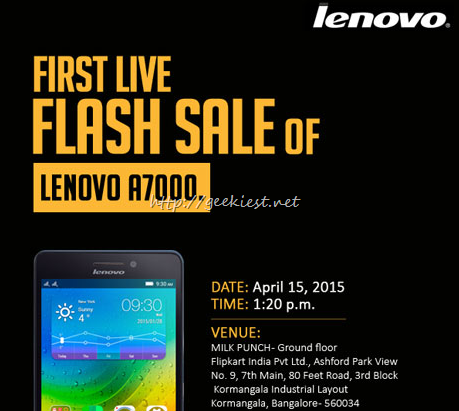 Lenovo A7000 will be available on Flipkart tomorrow(15 April, 2015) at 2.00 PM as a flash sale. Lenovo A7000 Launched in India for INR 8999. If you want to buy it you will have to register on the flipkart Lenovo page. With all these feature the phone will be selling out for a price of INR 8999. Not like the normal flash sale they have conducted for Mi, this time Flipkart is conducting an offline Live flash sale of the Lenovo A7000 also at its Bangalore office at Kormangala, Bangalore at 1.20 PM. So if you are from Bangalore you may rush to the Flipkart office and grab your phone right from there. 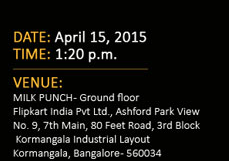 Lenovo A7000 live flash sale at Flipkart office Koramangala Bangalore at 1.20 PM tomorrow.